Once upon a time there was this little boy from Africa. This little boy went on a very long journey in a big metal bird to a far away land in the northern hemisphere; to a place known for it's lovely green grass (thanks to the peeing rain); great beer and humour. Once in this strange far away land, with a mere £2000 in cash in his pocket, the little boy headed to his local bicycle dealer in Gillingham, Dorset and bought his first "foreign" bicycle with a significant portion of his cash. His driver's license was no good in this strange country and his money wouldn't get him very far if he bought a car anyway, so a bicycle was the next best thing. His mother isn't dead yet either so a motorbike was out of the question too - she did always say "Over my dead body". The little boy loved his bicycle. It took him all over the show and when he moved closer to the big smoke, got a job and a company car (once his license was converted) he couldn't bear to part with his beloved bicycle so he kept it and continued to take it out to frolic, play and race in the sunshine and mud. Fast forward over 10 years and the little boy has grown up. He's married and has a new steed (for casual use when the car needs a rest). The home from which his precious bicycle was stolen (its replacement was knicked from the same place a few years later), is now known as "the in-laws'" and all is going well. Then it happens... no, not another bicycle stolen, instead he gets a phone call from the police. They've found his precious bicycle... the silver one... the one stolen over 10 years ago... his first "foreign" pride and joy. It's back. He's shocked. Surprised. Happy. Excited. Amazed. Pretty impressive. Yes folks, the little boy was me and my bike was stolen over 10 years ago from the garage of what is now my in-laws - they were the girlfriend's parents at the time. 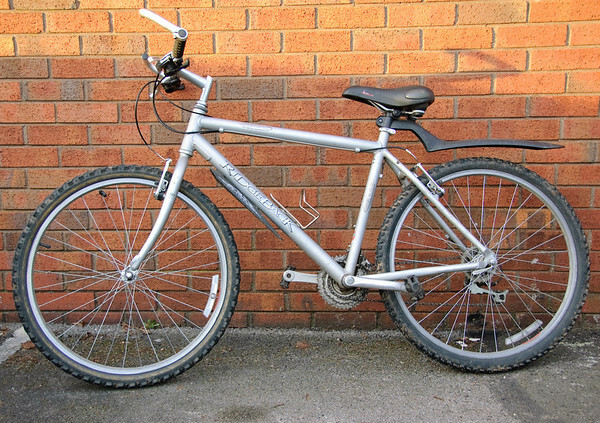 I received a call from Maidenhead police on Tuesday evening to say my long lost bicycle had been recovered and they wanted to know if I wanted it and if so, I can go collect it. Too shocked to ask any questions, I ended the phone call agreeing to collect my long-lost bicycle, which I did today. As you can see, it's still in pretty good condition and definitely usable. The only differences I can see are the metal toe-clipped pedals have been swapped for cheap plastic ones, the remnants of the computer removed (I had the computer so it was just the wires and sensor left), a new saddle, a new rear mud guard and a new back tyre. Otherwise it's exactly as I remember it. The police couldn't tell me how it got into their hands other than to say it was recovered from St Mark's Road in Maidenhead, about 4 miles from where it was stolen, and that no charges were going to be laid as the person with the bicycle is not likely to know it was stolen all those years ago. They traced it back to me thanks to the serial number printed on the crankshaft which I provided when the police report was initial raised. To say I'm chuffed and impressed is an understatement and if there's a take home message from this, it's make sure you keep the serial numbers of anything that isn't nailed down. It will come in handy if it gets knicked.